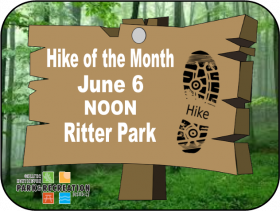 In celebration of National Trails Day, The Greater Huntington Park & Recreation District will host its Hike of the Month at Ritter Park on June 6 at noon. The American Hiking Society’s National Trails Day is the country’s largest celebration of trails, with hiking and other trail related activities taking place in every state across the nation! The GHPRD Recreation Team will arrive at 11:00 a.m. to register hikers to win a FREE Hiking Prize Pack! Registration for the Hiking Prize Pack drawing will end promptly at 11:45, so make sure you show up early to enter!